There is no participation fee to take part in the intensive research period, but registration is required. As the intensive research period includes six workshops, please link to them to register. 1- Probabilistic methods in statistical physics for extreme statistics and rare events. 2- Advanced asymptotics in PDEs and applications. 3- Multiscale modeling and simulations to bridge molecular and cellular scales. 4- Nanoscale mathematical modeling of synaptic transmission, calcium dynamics, transduction and cell sensing. 5-Reverse mathematical methods for reconstructing single molecular dynamics in cell. 6- Multiscale analysis and reconstruction of chromatin and nuclear organization. In the past decade, following major developments in live cell imaging, electrophysiology, superresolution and genetic engineering, novel mathematical modelling techniques have been developed to analyze, explain and characterize these data sets. These mathematical approaches include stochastic modelling, asymptotics of partial differential equations, numerical simulations and multidimensional data analysis. Yet, understanding, quantifying and modeling the integration of molecular processes at the cellular level remains an inherent multiscale problem. 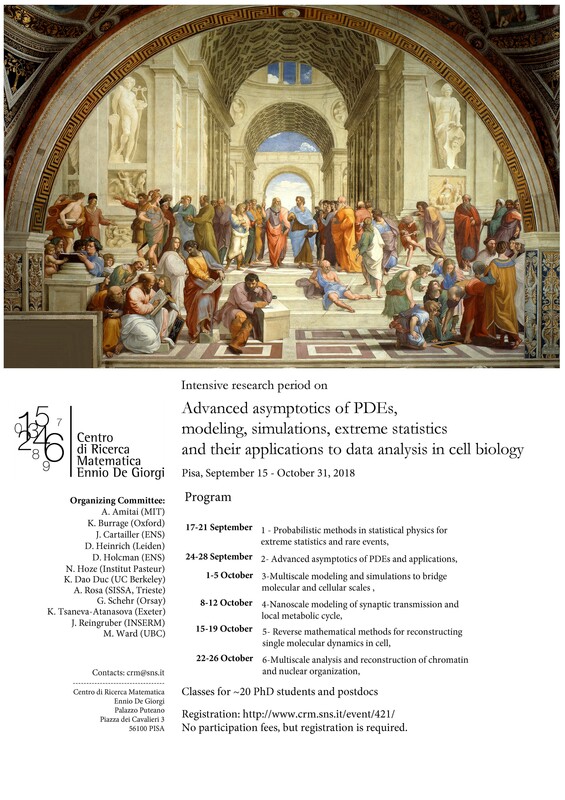 Our aim in this program is to present advanced analytical, probabilistic, numerical, and statistical physics methods for modeling and quantifying cellular functions and organization. The mathematical methods include asymptotic analysis of PDEs, stochastic processes, computer simulations of stochastic models, explicit computations of probabilities and moments of rare events, narrow escape theory, homogenization of boundary conditions. The models are stochastic chemical reactions in microdomains, stochastic polymer physics, statistical methods in high dimensions, matches asymptotics, Green's function theory, reconstruction of molecular and nano-domain shapes from superresolution data, reduction of dimensions by coarse-graining finer scales into mean field models. The domains of applications are wide and include statistical physics, applied mathematics methods, theoretical biophysics, particle and molecular trafficking, quorum sensing and collective dynamics, cell sensing at the molecular level of morphogenetic gradients during development, synaptic transmission, cell growth, DNA dynamics and nuclear organization and flux regulation in diffusion theory. The goal of the school is to bring together experts from applied mathematics, statistical physics and applied probability, computer science to offer an interdisciplinary view. Workshops and courses will help familiarizing the younger generation of mathematicians, physicists and computer scientists with the most up-to-date analytical and computational methods relevant in cell biology. One of the most important consequences of the meeting is to bring together both national and international experts in an emerging field, spread between physics, mathematics and computational biology. We expect that this meeting will foster existing collaborations and allows this field to consolidate. 1-Introduce modeling, asymptotic, extreme statistics, statistical physics to manipulate stochastic processes and also introduce the latest ideas of noise analysis, analysis of the Brownian motion, stochastic processes derived from biological problems. Explain how Markov processes are used as coarse-grained models. 2-Present recent results in asymptotic of Partial differential Equations, Mean First Passage Times, and Reaction-Diffusion. Introduce method based on Green’s functions, spectral analysis, asymptotic of eigenvalues, Laplace equation to compute asymptotic solutions. 3-Explain how to construct stochastic simulations in polymer physics, polymer looping, stochastic chemical reactions, diffusion in the nucleus, large simulations of nuclear organization, chromatin, DNA organization and molecular trafficking. 4-Model sub-cellular domains such as synaptic transmission, neurite growth and present methods derived from stochastic processes to analyze Single Particle Trajectories of large data sets. Reconstruct cell structure from large data sets. Please view Planned activities for more.